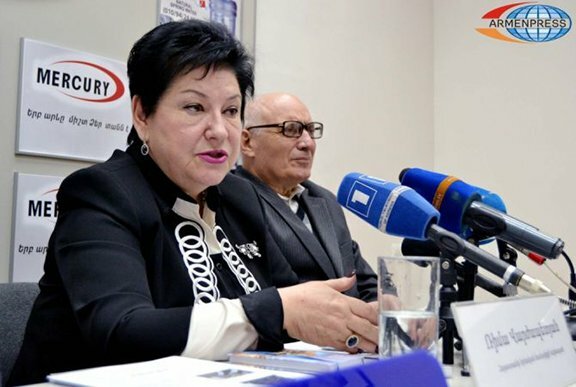 YEREVAN (Armenpress) — The Head of the Jewish Community of Armenia, Rima Varzhapetyan stated that steady and consistent work is required for the recognition of the Armenian Genocide. Presenting the experience of the Jews, Varzhapetyan mentioned that they speak and tell about the victims of the Holocaust every day, as well as build new memorials and reveal new facts. “In a word, the study does not stop; those events are not conducted from occasion to occasion. The events dedicated to the Armenian Genocide Centennial had a great resonance, and it should be continued in the same way, stopping it is impermissible,” the head of the Jewish community said. In her words, it is a widespread phenomenon among Jews to fund the process of Holocaust recognition. 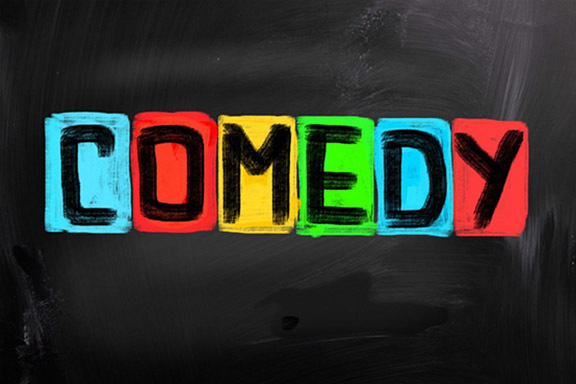 Research institutions, museums, and other projects like film production or publishing of newspapers are funded. According to her, there is not a single Jewish businessman that has no contribution in that work. “Instead of speaking to the world with a doleful expression of eyes, Armenians should be demanding, saying yes, it has happened and the memory of what happened does not fade and everything must be done so as the world learns about the incidents of 1915,” Varzhapetyan said, stating that it does not matter how long it has passed since the incidents, steady work must be carried out. Political factors should never come into any consideration especially for a country like Israel who has experienced the Holocaust. It’s a disgraceful conduct by the government of Israel unlike the Jewish people who want their government to fully recognize the Armenian Genocide. January 27 is the remembrance day of Holocaust victims. In over 30 countries of the world, including Armenia, numerous memorial events are organized on that day. The Jewish community of Armenia, together with the UN office in Armenia, will organize a memorial event on January 27. “Like the previous years, this year again we will gather at the memorial dedicated to the Genocide of the Armenian people and the Holocaust, and put flowers to pay tribute to millions of Jewish martyrs,” Varzhapetyan said. Referring to the developments in the Middle East and other parts of the world, Varzhapetyan mentioned that today Nazi forces are emerging, maybe forgetting the vicious realities of the 20th century. “We are witnessing painful developments in the Middle East and other countries. And if we do not say today ‘never again’, recurrence of Holocaust years cannot be ruled out,” Varzhapetyan said. In the words of the Deputy Head of the Jewish community in Armenia Karen Hovhannisyan, unfortunately, the world took no lessons from the Armenian Genocide of 1915 and later the Holocaust. “Inhumane developments go on. We witnessed what happened in a number of African countries, today the situation is tense in Europe. I think all these must foster sober-minded people to recall the past and do everything to exclude the black pages of the past to reoccur,” Hovhannisyan said. To the question why Israel has not recognized the Armenian Genocide till now, Hovhannisyan mentioned that politics matters here. “According to a survey conducted in Israel, the majority of the public favors Armenian Genocide recognition. Unfortunately, often the opinion of the public and politicians differs. 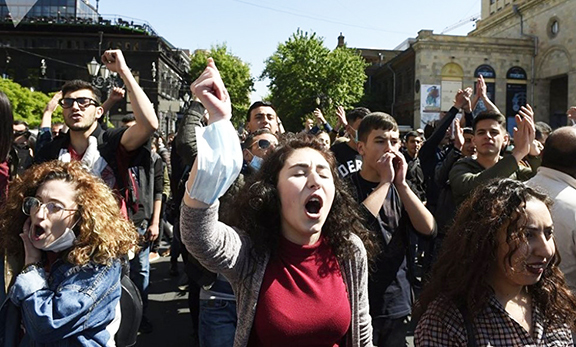 Many politicians promise during their pre-electoral campaign that they will recognize the Armenian Genocide in case of being elected, but as soon as they are elected, they forget their promise,” said Hovhannisyan. The representatives of the Jewish community highlighted the role of public diplomacy for that issue. Turkey will recognize the Genocide before Israel.